1 Quick Access Toolbar. As in most WINDOWS® programs, this toolbar includes by default, the basic file-handling functions (save, open, new), plotting and Undo and Redo commands. Of course it can be customized to show your most used commands. 3The Ribbon. 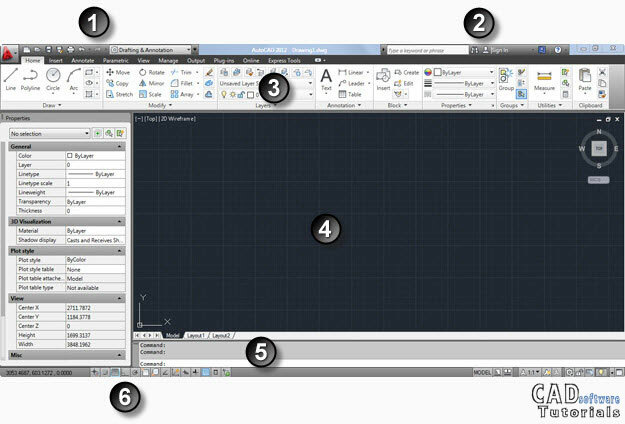 The Ribbon is where you´ll find a lot of drafting tools and features, grouped in panels. Also, sets of related actions panels are grouped in tabs. So you will find, for example, the Insert tab, with panels such as Block and Reference and Data, among others. 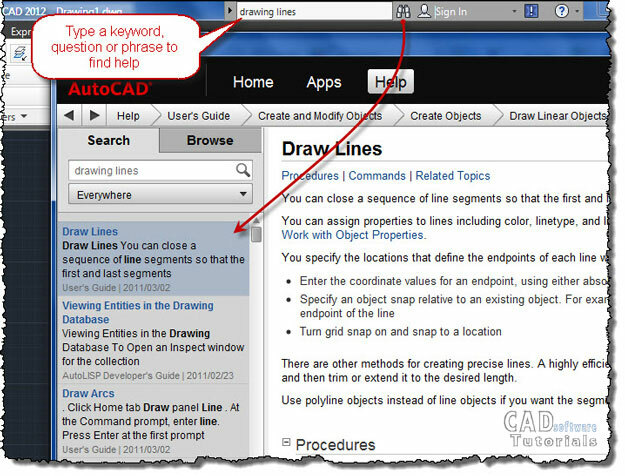 The most prominent feature in the Ribbon, especially for those people looking forward to learn how to use AutoCAD as fast as possible, is the tool tips. In such a case that help shown in the tool tip is not enough to learn how to use AutoCAD tools, note that from here it is also possible to access to AutoCAD contextual help pressing F1, where for sure you will find detailed information about selected tool. Of course there are a lot of important features in the Ribbon, but we´ll explain them in detail on futures AutoCAD tutorials. 4Drawing Area (or where the magic begins). Most of AutoCAD window is occupied by the drawing area, as this is the place where all your drawings will appear. Note that, when you move cursor within this area, crosshairs appear: this is the drawing cursor, which lets you picking points in the drawing area. The L-shaped figure in the lower-left corner of the drawing area is the UCS (User Coordinate System) icon and, as you think, indicates the X and Y axes in the Cartesian coordinate system. Below the drawing area you will see: One Model tab which is where all the drawing will be done, usually, to real scale (1 drawing unit = 1 ft, for example) and one or more Layout tabs (also known as Paper Space) that are like the sheet of paper where you´ll plot your drawing to scale. 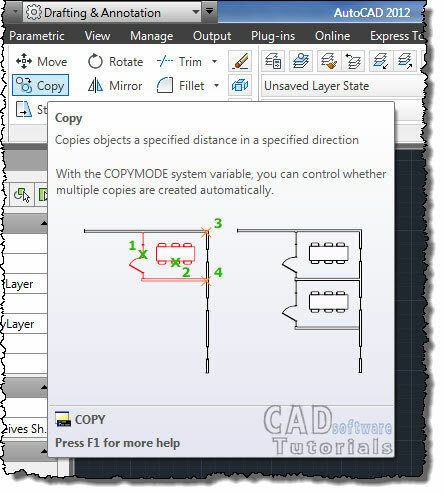 Paper Space is a powerful feature in AutoCAD, being possible to have multiple views (layouts) at different scales of a drawing created in model space. Moreover, in a simple layout, it is possible to plot several views of the same drawing on a single sheet of paper, each view having a specific plot scale. This is useful when showing details in a design. 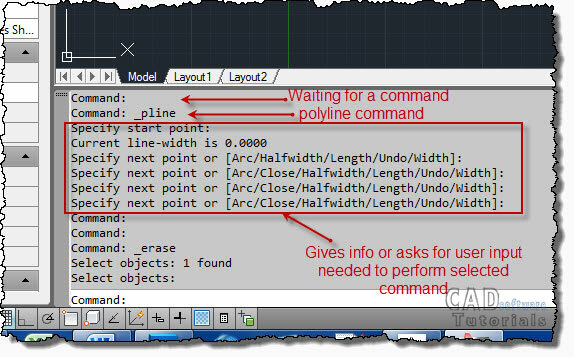 5The Command Window (or how AutoCAD communicates with you). 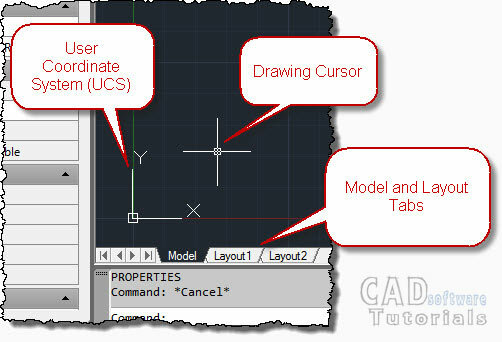 An important step knowing how to use AutoCAD is to understand what the command window is. 6The Status Bar. 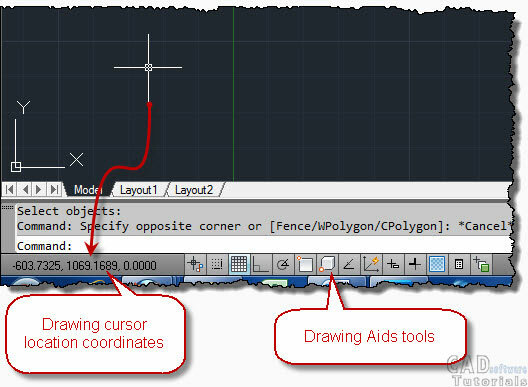 Status bar, located at the bottom of the AutoCAD window, gives the drawing cursor location coordinates in its far left, besides it contains several tools to aid in the drafting process.